Summary: Powerful love comes with a price. Who will be the sacrifice? Review: I’m pleased to say that the Lynburn Legacy trilogy ended on a solid note with Unmade. While there were a few missteps, the book was a compelling, fast-paced read that ultimately answered the most important questions I had going into the story. It took me a little while to find my footing, but I think that is more a reflection of the fact that I read the previous book a year ago and less to do with any actual problems in the narrative. Kami, our heroine, was a delight as always. Some of the most powerful scenes in Unmade were when Kami had to deal with the consequences of her or others’ decisions, whether that was counted in deaths or emotional fallout. I can’t really talk about any of these scenes without spoilers, but there were some great passages dealing with grief and fear and sacrifice, and I found myself tearing up on more than one occasion. The other members of the Glass family—how they deal or don’t deal with the various tragedies and traumas in the book—stepped further into the spotlight, and the book was all the better for it. Kami’s friends and allies were also some of the highlights of the book. While their quips and humor weren’t always on the mark for me, I was deeply invested in their health, happiness, and survival. While Angela and Jared continued to be favorites, I found myself drawn to Lillian in particular, which was an unexpected, but welcome, surprise. Sarah Rees Brennan’s characters were memorable and engaging, and I wished that several of them had been given more screen time or even their own POVs. I will admit I was apprehensive throughout the book that the complicated and messy romantic relationships between characters would distract from the life-or-death peril, but Rees Brennan did a great job of not sacrificing the “bigger picture” plotlines for the romantic ones, and vice versa. The balance can be tricky to get right, and Rees Brennan generally knew when to swap from one flavor of distress for another (and when to combine them both). 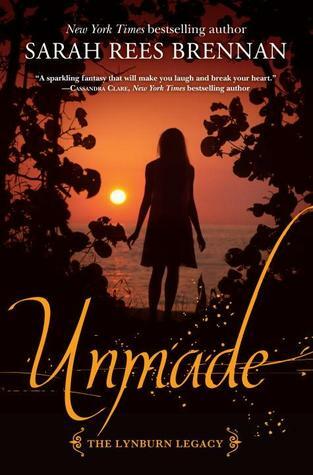 Unmade was not perfect. Perhaps my greatest complaint is the climax of the book, which I felt was a bit too rushed after everything the characters sacrificed to get there. (Then again, that could just be my bloodthirsty desire to revel in the bad guys’ defeat.) My interest in Rob as the villain—and thus one of the major drivers of the plot—was inversely related to how much power he acquired, so by the end of the book I was pretty tired of him. As a whole, Rob and his sorcerers were largely forgettable, and the few that were slightly less awful than the others didn’t receive enough screen time for me to care about what happened to them. Recommendation: Get it soon if you are a fan of the series. Unmade is a mostly satisfying conclusion to a strong fantasy series. While the Lynburn Legacy trilogy had its moments of weakness, it also delivered some wonderful characters who got to face difficult decisions and their consequences. Overall, I’d recommend the series to readers who enjoy gothic-flavored stories, mysteries and murders, and messy feelings everywhere.